aul Ricker uses NPACI supercomputers to perform crash test simulations. But these aren't the automobile collisions that Detroit car manufacturers simulate on their computers. The University of Chicago astrophysicist studies the largest objects in the universe--entire clusters of galaxies. Held together by gravity, clusters are typically more than 5 million light-years across, with a mass of a thousand trillion suns. Collisions between clusters involve effects from very large and very small scales, from entire galaxies to hydrogen atoms. By accurately simulating the cluster collisions, Ricker's computer-based models can lead to insights into fundamental questions of cosmology, such as how fast the universe is expanding and how much matter out there is invisible to astronomers. "The formation and evolution of galaxy clusters are complex, large-scale events that involve many interacting physical processes and span a significant fraction of the age of the universe," Ricker said. "We can't watch this evolution in real time. We can only simulate the processes in collisions and compare the clusters we observe in the sky to various models as they evolve." Clusters of galaxies consist of three components. First are the galaxies themselves, which contribute only a few percent of the total mass. Second, between 10 and 30 percent of the total mass is in the the intercluster medium (ICM), a hot, very rarefied gas--typically only one atom per thousand cubic centimeters or so. Finally, the dark matter, which has never been seen, may comprise 70 to 80 percent of the total mass; astronomers infer its existence from its gravitational effects on galaxies. The ICM is so hot, at 10 million to 100 million degrees Kelvin, that it emits X-rays and makes galaxy clusters among the most luminous X-ray sources in the universe. These X-ray emissions give astronomers some of their best observational data concerning the dynamics of clusters. The ICM density is highest near the centers of clusters, and in some clusters the ICM quickly radiates away its energy here and cools to about 1 million degrees. The lower temperature results in lower gas pressure and causes the ICM to flow towards the gravitational center of the cluster. These cooling flows are observed in more than half of all rich galaxy clusters and can move more than 100 times the mass of the Sun per year into the giant elliptical galaxies that lie at their centers. On the other hand, colliding and recently merged clusters typically do not show cooling flows. The signatures of such mergers include distortions of the X-ray emission regions, twin X-ray emission centers, and temperature variations that indicate collisional shock waves. With his simulations, Ricker has been investigating the hypothesis that the shock heating from collisions and mergers "turns off" cooling flows. P. M. Ricker. "Off-Center Collisions between Clusters of Galaxies." The Astrophysical Journal 496 670 (1998). This sequence from a simulated merger between two cluster of equal mass shows gas density (logarithmically spaced contours) and temperature--ranging from 0 keV (blue) to 6 keV (red)--in a slice through an off-center cluster collision and merger. This simulation was run on the CRAY T3E at the Pittsburgh Supercomputing Center. "Simulations covering the necessary range of length scales while accurately handling all of the important physical mechanisms have only recently become available through the use of parallel computers," Ricker said. He began his research using the CRAY T3E at the Pittsburgh Supercomputing Center (PSC). As NSF-funded research accounts shifted to sites in the Partnerships for Advanced Computational Infrastructure program, he transferred his simulations first to NPACI's CRAY T3E at the University of Texas at Austin, then to SDSC's larger T3E. Recently he has also performed simulations on the PSC T3E under DOE sponsorship as part of its Accelerated Strategic Computing Initiative (ASCI). Ricker has constructed complex 3-D models of cooling-flow clusters, then simulated collisions between clusters with different mass ratios, ICM gas fractions, and impact speeds. The simulations take into account the gravitational effects of gas and dark matter, hydrodynamic shock heating of the ICM, and radiative cooling of the gas. The optimum choices of time step size and length scale resolution depend on the number of processors available for the simulation. Clusters 10 million light-years across must be resolved to at least as small as the central galaxy of a cluster--roughly a thousandth of the cluster's width. The time scale is similarly immense. An object can take more than a billion years to fall from a cluster's edge to the center. The full evolution of a merger can require more than 10 billion years. Since the estimated age of the entire universe is less than 20 billion years, the final stages of some simulations are actually predictions of the far future. Three numerical simulation code packages model the evolution of collisions. A parallel hydrodynamic code, written by Ricker, based on the piecewise-parabolic numerical method (PPM) computes the gas dynamics, an isolated multigrid solver calculates the gravitational fields, and an N-body particle-mesh code developed by Scott Dodelson of the Fermilab Theoretical Astrophysics Group tracks the motions of stars and dark matter. The simulation has been specifically adapted to parallel computers by dividing the 3-D volume of space in which the collision occurs into adjacent subdomains, each of which is controlled by a separate processor. For inter-processor communications, Ricker uses the Parallel Virtual Machine (PVM) library, which ensures maximum portability of the code between systems. PVM handles both massively parallel computers such as the T3E and, less efficiently, cluster architectures. Most of the interesting physics occurs in predictable regions of the simulation volume, so the simulations also vary the grid scale accordingly and take advantage of some processing shortcuts, according to Ricker. By placing small simulation zones where high resolution is needed and larger cells outside the main interaction region, he uses fewer processors and substantially cuts the simulation's processing time. His first runs on the Texas T3E ran for about 48 hours each on 32 processors. "I was getting only marginally adequate resolution on the smaller machine," Ricker said. "We'd like to do high-resolution runs at two values of each parameter to better resolve the cooling flows and to check the convergence of the results." 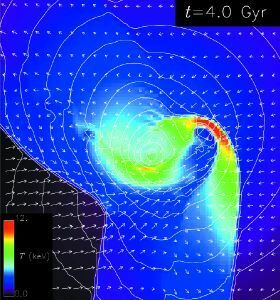 A simulation on the CRAY T3E at SDSC of an off-center merger, with one cluster three times the mass of the other, indicates an off-center collision heats the ICM and may disrupt any previous cooling flow. Gas density is shown by log contours and temperature by color. Arrows indicate direction of gas flow. In an example merger, a strong shock front dissipates the cluster cores' kinetic energy as heat in the surrounding gas. This causes the X-ray luminosity to increase briefly and slows the two cores, allowing them to capture each other gravitationally and eventually coalesce (Figure 1). The infalling cores drive curved bow shocks that transfer the cores' angular momentum to the surrounding gas. 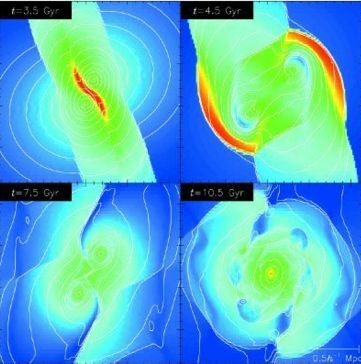 Long after the collisional shock front has passed through the cluster volume, material in its wake falls back toward the merged cores and creates a secondary accretion shock around the cluster. The evolution of the cooling flows seems to depend on the mass ratio and impact parameter, but in unexpected ways. "We had thought that merger shocks would raise the disorder in the cluster cores, causing the cooling time to increase and shutting off any cooling flow," Ricker said. "However, an off-center collision, which produces more mixing, has a better chance of shutting off a cooling flow" (Figure 2). Ricker had expected an equal-mass, head-on collision, which produces the strongest merger shock, to be most effective at shutting off the flows. But the merger shocks actually don't increase the disorder much. The core entropy rises after the primary shocks have passed through and the shocked material in the outer parts of the clusters falls back onto the remnant and mixes with the material there. Ricker is refining his simulations, looking at the dependence on mass ratio and preparing to compare the simulation results with new X-ray observations. "Ideally, we'd also like the simulation to track the percentage of elements other than hydrogen and helium in the ICM and their ionization states, because not only would that let us better interpret X-ray observations, but also it would bears on several other issues in cosmology," Ricker said. Observations from the Einstein, ROSAT, and ASCA X-ray astronomy satellites indicate that more than 20 percent of clusters show significant substructure in their X-ray images, often because of mergers. The number is probably higher than this, because unfavorable geometry may hide such indications as double cores. NASA plans to launch the Chandra X-ray Observatory satellite this summer, and soon a set of much higher quality X-ray images of galaxy clusters will be available to compare to Ricker's simulation results.